Did you know that your deck contributes to a third of the value of your home? A well-maintained wood deck brings a handsome connection with the outdoors, adding to a home’s natural beauty and appeal. You can either cozy up on winter afternoons or use it as a gathering place for parties. Adding a few thoughtful touches makes it an ideal place for entertaining all-year round. Whatever the event, doing regular maintenance with local pressure washing restores the natural beauty of your wood deck and also increases its resale value. Instead of sweating over it by your own, make sure to call the experts. They have the right knowledge and equipment to remove stains and pollutants without leaving behind any signs of damage. Wood, like any other part of your home can get damaged over time by the elements and needs maintenance. Cleaning solutions and brighteners work well for the most part. However, in case your deck is made from South American hardwood such as Tigerwood, Camaru, or Ipe, you may want to use a pressure washer. A simple garden hose with sprayer will do the job. You can use it to rinse all the grime away from your deck. 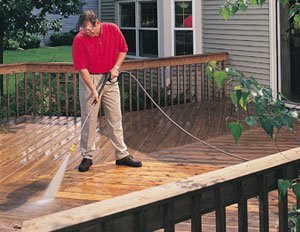 Again, a simple pressure wash works for decks made of processed or pressurized wood. But, don’t hold the nozzle too close to the wood. 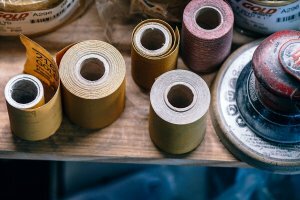 Similarly, it is advisable to start with a low-pressure nozzle at a spot where you can check if spray is etching the wood or splintering the fibers. Most importantly, cleaning along the length of wooden boards avoids any damage. How Do Experts Pressure Wash Wood Decks? 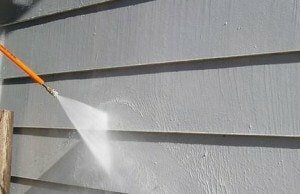 Whether you’re pressure washing your wood siding, your wood deck, or maybe your wood fencing in your backyard; you need to be very careful when you’re cleaning it using a pressure washer. You may end up damaging it if not done properly. When your wood deck needs cleaning, a professional pressure washing company gets the job done right. They clean the surface thoroughly, removing any environmental pollutants like mildew, algae, or mold – all while protecting your home from any damage. Not all surfaces need to be cleaned with maximum pressure. Wood has a soft surface that needs gentle cleaning. That’s why selecting the right tip is imperative. With the right tip you protect your wood deck from getting ruined. Generally, a fan tip or a rotating tip is used with a spread of 40-60 degrees. Pressure allowed is as low as possible. 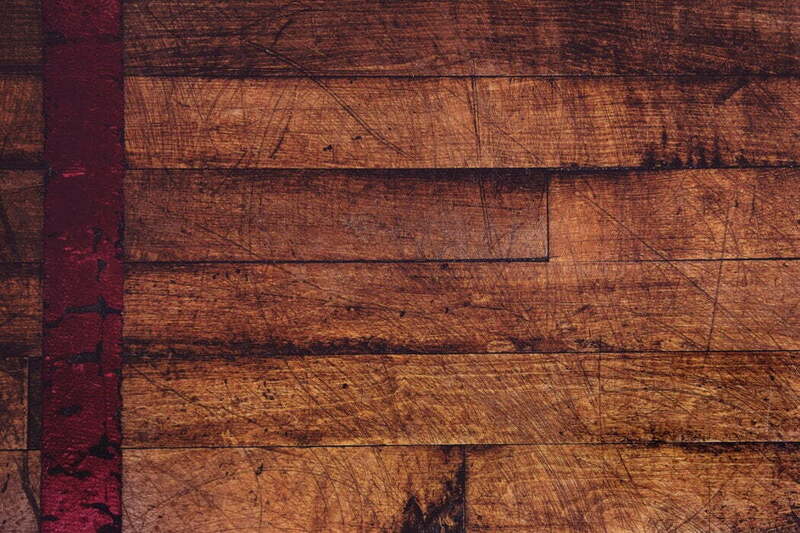 While hardwoods may tolerate pressure up to 1200 psi, softer woods are cleaned with pressure between 500 and 600 psi. Before getting started, they test the pressure in an inconspicuous spot of the deck where any damage won’t be prominently visible. 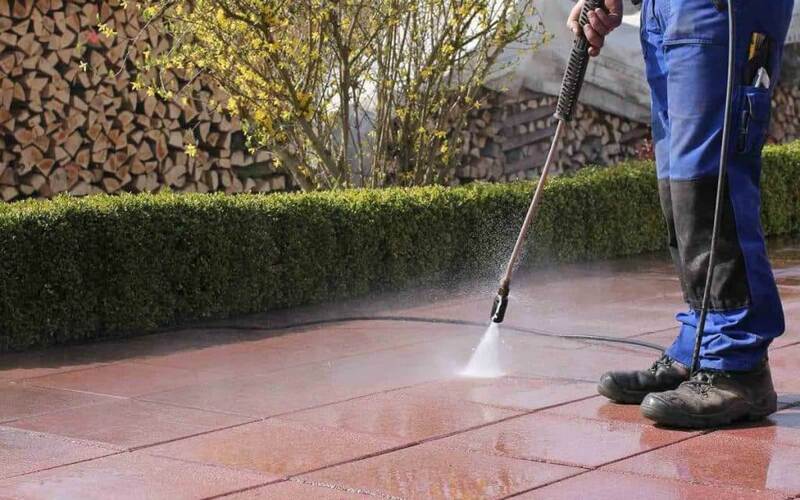 Remember, a pressure washer is powerful enough to etch wood if used with too much jet pressure. Spraying the deck with a washer tip placed too close to the wood is a recipe for disaster. It causes permanent damage in the form of imprinting marks or lines. Experts avoid this by maintaining proper distance between deck and pressure washer tip. Give your deck some space and use the washer from afar to allow smooth application. Spray in a moderately paced motion to clean the surfaces evenly without leaving behind ugly lines. 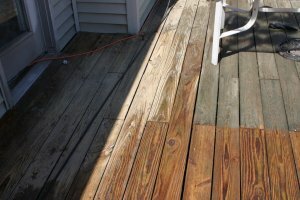 It takes effort and experience to know the right techniques for power washing your wood deck. Ideally, begin with low-pressure settings and increase this pressure little by little. This will clean the deck without etching or damaging its surface. You can do the same by keeping the washer tip at some distance and lowering the wand up to 12 inches from the surface. Use a sweeping motion and pivot the wand with your arms to clean evenly. Throughout this process, maintain a consistent distance through lateral movement of your arms. For even cleaning, start with the hotspots or visible edges that need local pressure washing. Additionally, do not forget to wash with the grain and never go against it. When pressure washing your wood deck, you’ll want to clean the area without ruining or eroding wood fibers. Softwood fibers tend to get splintered when they are wet, particularly on handrails. Thankfully, there’s a remedy to this problem: sanding. Spot sanding on wood surfaces is the ideal approach to follow, but if you are planning to refinish the area, sanding the entire deck is essential. It results in smooth boards with minimal splintering. The process of sanding opens up pores that allow wood to soak up the stain or sealer. For the desired results, use 60-80 grit sandpaper for sanding the deck surface. As you can see, when it comes to pressure cleaning wood surfaces, technique is everything. So, make sure you follow the right procedure. 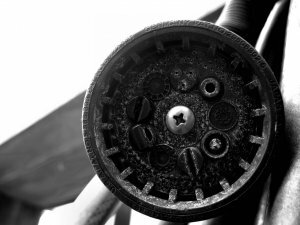 Hire an expert Tampa Bay pressure washing company that offers effective cleaning at excellent prices. Call Peter’s Local Pressure Washing Services to Clean your Wood Deck Today! If you want a cleaner deck without ruining or damaging the wood surfaces, call Peter’s Pressure Washing at 813-455-3670. We offer a free estimate and the best quotes in Tampa Bay for professional power washing.